» Our range of belt conveyor curves and belt conveyor merges, help solve the problems that exceed the limitations of standard belt conveyors. » Belt conveyor curves, gravity bends and merge conveyors enable the mapped flow of integrated conveyor systems to be achieved in the best way possible. Gravity roller conveyor bends, Powered belt conveyor curves and angled merge conveyors can be purposely built to suit designed conveying applications. Various conveyor angles are available to suit conveyor system integration,from a bespoke conveyor system, to an end of line change. 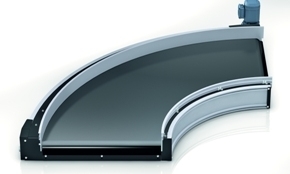 » Belt conveyor curves and belt conveyor merge sections feature a robust design. 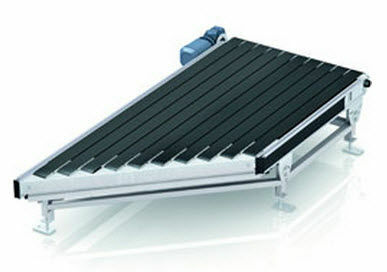 Conveyor frame depths can sit as low as 170mm, with low output noises. 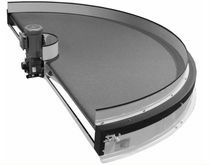 Some belt conveyor curves feature an automatic tension device, which is incorporated alongside a robust guidance system, offering a low maintenance solution in conveyor system design. » Belt conveyor curves and belt conveyor merge units are designed and built to suit customer needs. All products are shipped ready for installation, dispatched as ready to use conveyor modules to suit a wide range of conveyor lines. 2. Powered Line Shaft Conveyor Bends.